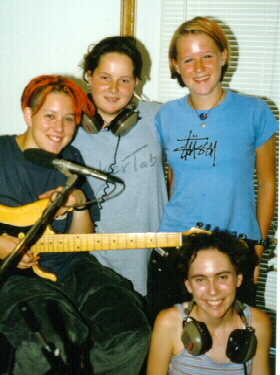 In 1996, Nieve Pearl spent her Junior year of High School as an exchange student in Germany, where she met Daggi and Alex, and they began to write music together. A year later Daggi and Alex visited Nieve in Las Cruces, New Mexico, and with Nieve's talented friend Amber playing bass, they spent two days in a small studio recording this album. All now have other things happening in their lives, and this one-time performance by these four unusually talented young women stands as a unique accomplishment. Their songs are soft rock, warm, optimistic, sometimes funny, and fun, and also tender and poignant. From the left, that's Daggi (guitar, backup vocals), Nieve (lead vocals), Alex (percussion), and Amber (bass), at the recording session. Daggi and Alex came all the way from Germany to be there. To hear a second track, click on the start button.